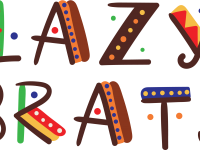 LazyBrats is an year old small setup, which deals in hand painted customised items. Brainchild of Amita Bajaj, she is experimenting with different stuff right now (Mainly hand painted products). She has a group of enthusiastic artists, who love to paint. After working in IT sector for a decade, she wanted to start something creative and hence LazyBrats was born. Her work shows her passion towards the artwork. LazyBrats started with canvas shoes, then came Ballerinas, Kettles, Earrings, Clutches, Passport Organisers and more items are in pipeline like Coasters, stationary etc.